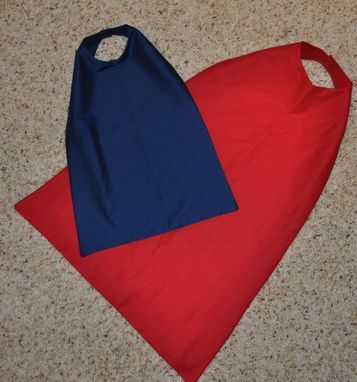 Super Hero Capes For Ages Nb-3t. Custom Made, You Pick Color. Free Usa Shipping. Super Hero capes for boys and girls of all ages that dream to be the hero, or villain if they please. This is made by me with 2 layers of cotton fabric in any solid color of fabric. This listing is for the smaller size, ideal for newborn up to 3 yrs and is 16.5" long at the back of neck opening to the bottom of cape. They close with a velcro attachment.